Techarex Networks provides QuickBooks hosting on its servers. QuickBooks is hosted on its cloud infrastructure and you can perform your accounting operations on the go without any lag. You can access your data from anytime, anywhere and boost your productivity. Techarex offers free migration and setup if you are switching from any other QuickBooks hosting provider to them. Techarex guarantees 99.995% server uptime. This provider uses the highest security standards including a secure connection, 128-bit encryption, and fully clustered multi-tiered architecture. It utilizes Tier IV+, SOC, and SSAE-16 compliant datacenters and PCI-DSS compliant data security. All your files are backed up 24 hours in multiple locations to ensure your QuickBooks data is always protected. Plus, Techarex provides easy data transfer with the help of its experienced team. Limited number of hosting plans. Each company has its own characteristics, and might call for a special solution that will be adjusted to their business size, type of clients and staff and even individual industry they cater to. You should not count on getting an ideal service that will work for each company regardless of their background is. It may be a good idea to read a few QuickBooks Hosting reviews first and even then you should pay attention to what the hosting service is supposed to do for your business and your workers. Do you need a simple and straightforward hosting with only essential features? Will you really make use of the advanced functionalities required by pros and big enterprises? Are there any specific tools that are especially beneficial for the industry you operate in? If you ask yourself these questions it will be much easier to find a trustworthy service that will fit your budget. We realize that when you make a decision to buy Hosting Services it’s important not only to see how experts evaluate it in their reviews, but also to find out if the real people and companies that buy it are actually satisfied with the product. That’s why we’ve created our behavior-based Customer Satisfaction Algorithm™ that gathers customer reviews, comments and QuickBooks Hosting reviews across a wide range of social media sites. 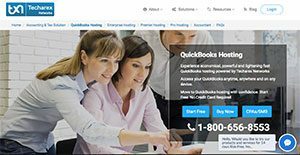 The data is then presented in an easy to digest form showing how many people had positive and negative experience with QuickBooks Hosting. With that information at hand you should be equipped to make an informed buying decision that you won’t regret. Techarex offers round the clock support on phone, chat, and email in less than 10 seconds. Techarex provides reliable security. Its SAS 70 certified data centers are secured to provide you maximum security and reliability. Plus, the provider runs dual backups which are kept on two different Cloud locations to ensure additional security from data loss. Password protected account access, anti-spyware software, and updated hardware firewalls further prevent any sort of unauthorized access. Techarex accepts credit and debit cards. Techarex QuickBooks Hosting offers many benefits for eCommerce businesses. Techarex guarantees 99.995% server uptime. There is no info available about reimbursement for downtime. There is no information available about unlimited email addresses, but you get unlimited bandwidth with the QuickBooks Premier Hosting package. Do they let you easily set up a website without any HTML or coding skills?